Well, now I am in year two of the Magazine. I thought I would take some time this month to reflect on where I’ve come from, and where I am going, with the Magazine. Hopefully, it will interest you, as my main purpose is to make you more effective in your career, in your business, with your learning, and in your personal life. 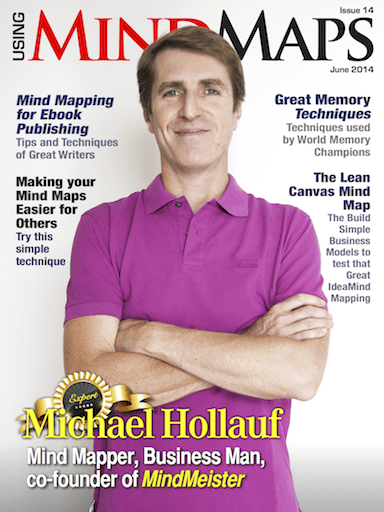 Michael Hollauf and his business partner, Till Vollmer, founded MindMeister out of a personal need for a tool that would allow them to brainstorm collaboratively in the form of a mind map. Now, seven years after the beta release, MindMeister is one of the market leaders in online mind mapping. Michael Hollauf talks about obstacles, current and past, and reveals for the first time what’s been going on at MeisterLabs these past few months. In my previous article, I wrote about how to use mind mapping to discover the reasons you would want to publish an eBook. Once you’ve established that, the next step is to actually write the book — which can seem an incredibly daunting task. So, I enlisted the help of authors who literally and figuratively wrote the books on writing: Anne Lamott with Bird By Bird, Stephen King’s On Writing, The Artist’s Way’s Julia Cameron with The Right to Write, and screenwriter Robert McKee’s Story. After re-reading each book with an eye on how mind mapping might be most beneficial to the writing process, I came away with one clear answer: synthesizing. One way to significantly improve the quality of your mind maps and the effectiveness of how they communicate your intended meaning to others is to include a legend in them. If you frequently share your mind maps with colleagues and coworkers, they may not completely understand the meaning and context of what you’re trying to communicate. That’s because mind mapping lacks a commonly accepted visual vocabulary – a set of de facto standards that governs how mind maps should be constructed, what common icons and symbols mean, and so forth. MindManager has always been an excellent tool for hosting effective and efficient meetings. We created the Meetings Jetpack to make it even easier for you to get the most out of all your meetings. Here are a few tools, tips, and techniques from the eBook included in Meeting Jetpack, A Guide to Better Meetings. Do you have trouble remembering? Do you have trouble remembering telephone numbers, birthdays and anniversaries? Do you struggle to remember a sequence of more than seven digits? It is the fusion of the emotional and logical aspects of the human brain that shapes long-term memory and recall of information. However, most people struggle to recall information because they simply don’t yet understand the power of patterns, imagination and association. The Number Associations IQ Matrix map will help to shed some light on the process of remembering numbers through the application of shapes and rhyme. Tony Buzan, in ‘The Ultimate Book of Mind Maps’ introduced me to a method called ’TEFCAS’. • Trial • Event • Feedback • Check • Adjust • Success I was always intrigued by this, but never really applied. But, after reading the book, ‘Running Lean’ by Ash Maurya, I found a practical tool to apply this method. This month we are very excited to announce the news that the 5th Biggerplate Unplugged Mind Map Conference has now been confirmed for October 16th 2014, and will be taking place in the wonderful city of Berlin in Germany! This next instalment follows on from a highly successful event in San Francisco back in March, where over 70 mind mapping experts and practitioners gathered to share ideas and experiences in California! As we continue to bring this event to the most active mind mapping locations around the world, it makes complete sense for Germany to be the next stop in the series, based on the well-established and highly active community in the region!